In front of our house at the corner of our lot we have a berm. The berm has been in need of a reconfiguration for several years. I finally have a place to move at least one of the shrubs from here. I had my Dearly Beloved move one to the area opened when the pine trees came down by the new fence. He had quite a job wrestling this overgrown bush. His Dad gave us two of these Burning Bushes several years ago and I didn't have a place for them so when the berm was having issues of things dying on it I plunked them here. I always figured a place more suitable would appear at some time. As you walk up to the side fence you can see it in its new home. No doubt there will be more to plant along this fenceline. We have a start and it feels good. I think it looks pretty good at this site too. This fall when it turns red it will look very pretty with all this white fencing as a backdrop. You can see there is a hellebore and some ferns in the foreground. There is also a ratty looking azalea that refuses to die. Maybe it will perk up with it getting more sun. I also planted some daffodils that a friend brought to me. I have no idea what color they will be. I hope it all takes. 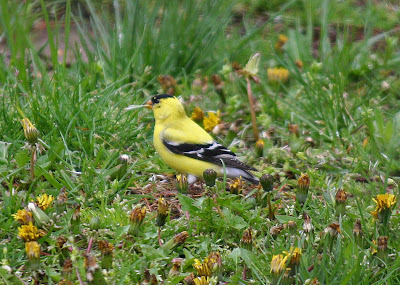 Reason number one is the lovely little American Goldfinch. These beautiful lemon yellow birds that are often called Yellow canaries by some, they just love the seeds. Maybe that is where they get some of that yellow color, from injesting some of the pollen from the dandelion. Nahh... just kidding there. A little garden fairy told me to say that. The birds work so hard eating the seeds. They pull them from them from the cluster, waller them around so the seed part is in their mouth then sever the fuzzy end off and chew up the seed. It wears me out just watching them. They do so enjoy them. 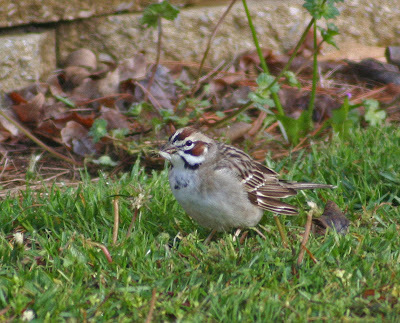 The second reason is the Lark Sparrow. This colorful sparrow looks like a brute while munching alongside of a Goldfinch or Chipping Sparrow. It measures at a whopping 6.5" long. A Goldfinch is 5" and a Chipping Sparrow is a mere 5.5" long. 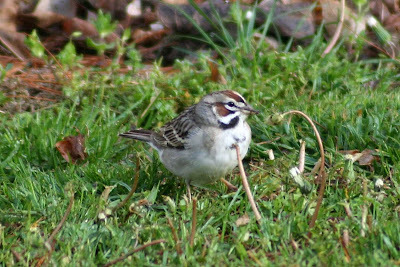 The Lark Sparrow is a bird that is on a watch list for Inidana. They used to be common but are no longer thought to be so. The State Biologist likes to hear about areas where they are found nesting. Luckily we know of 4 places in Knox County where they nest. So if your neighbors complain to you about the dandelions that are popping up in your garden you just tell them that you are helping at risk wildlife by leaving them in the garden. 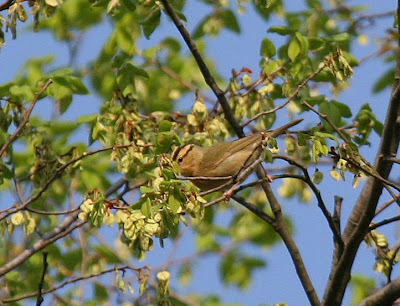 Not only do the at risk birds like dandelions other birds, such as Indigo Buntings , White-crowed Sparrows and most other seed eating birds eat those seeds. Bees who are having a difficult time in early spring finding pollen love those blossoms too. So have a heart a leave a few for the wildlife. My Dearly Beloved took these pictures for me. He had a difficult time getting the picture with the fuzzy part sticking out of their mouth. Especially with them so far away from where he sat. Thank you Dear. Sunday was a gorgeous day to be outside. The weather cooperated almost all day until the cold front started blowing through. I tried to sit out in the garden and just be but that didn't last too long. I pulled a few weeds and then noticed that the House Sparrows were buiding in the new Martin Houses. I got a ladder and cleaned out the boxes. While up on the ladder I noticed that the garden looked different from a birds eye view. Here is a picture of this corner of the garden from the vantage point of the Martin Houses. I kind of liked the way you can see how a couple of the flower beds are round. You can see I have grass paths that run through the back. You can also see the Irises blooming as well as the Japanese Kerria bush on the other side of the fence. This view also made me think of Frances and how she views much of her garden from a higher vantage point. Do any more of you Garden Bloggers garden on a hill and have a hill top view of your garden? This is a view from the ground level from the other side of the flower bed. The Martin houses are in the back. I put a cross bar over the top of the houses as Ruthie suggested for the Martins to commune on. So far no Martins but I like the welcoming affect of the houses. I had a neighbor say she liked seeing them. On the outside of the fence I moved the ladder over a few feet and took a picture toward the apple tree. The flower bed around it is also round. 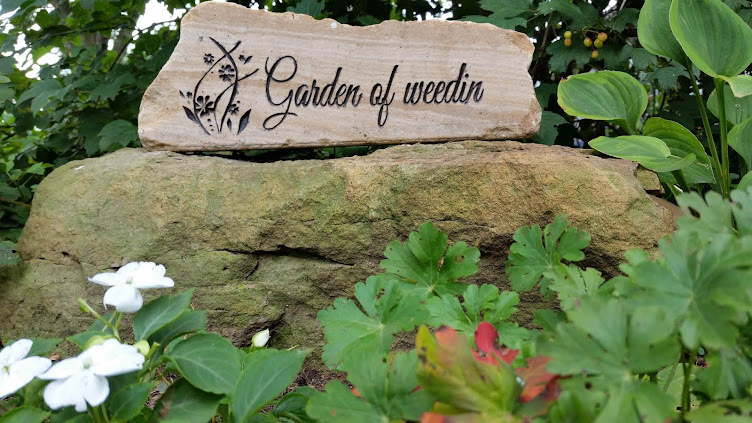 So if you want a different view of your garden. I would suggest get a ladder out and have a look around your garden. While walking at the park we came upon this box turtle crossing the road. Why do I consider this an outstanding find you ask. Well, when was the last time you saw one of these critters? I would imagine it has been some time. Of course when we were kids they were quite abundant. No one thought anything about seeing them. However now they are on a watch list for Indiana. They are not an abundant animal now. It was Luna's first time to see such a thing. She couldn't figure out why I was so excited and taking pictures of this animal. I moved it to the side of the road so it could get on its way before someone ran over it. Luna couldn't believe I was paying attention to such a thing. Of course it closed its shell and didn't venture out while we were around. I hope it made it to its destination safely. Our next big find you might not appreciate unless you are into birds. 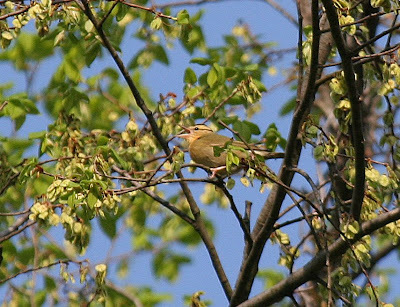 This Worm-eating Warbler was what got my heart singing. As he sat in a tree singing his heart out we were below just soaking up the view and listening to his song. Why am I so excited about this little song bird? It is the first time in 5 years that I have seen one for one thing. Secondly it is the first time I have seen one in Knox County. These birds are usually skulkers on the ground. You can tell by its coloring it is difficult to see, especially if it is on the ground where it usually is. They also nest on the ground which makes them fairly easy prey for most any animal. This little guy must have been pushed down into the forest by the storm that passed through the night before. He didn't sit still for long as he was busy picking insects off the tree leaves. You just never know what you might find when you venture out to the park. 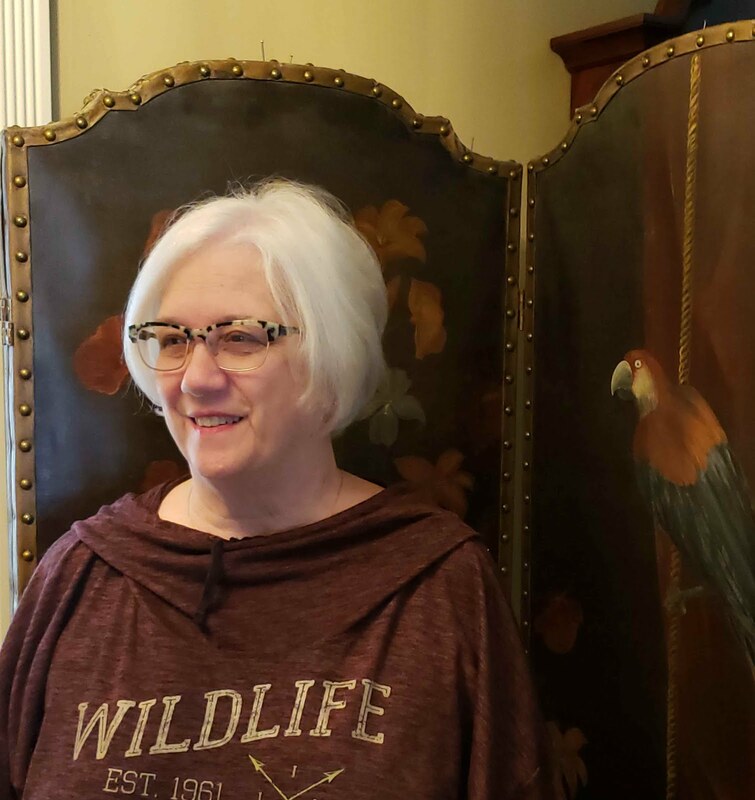 I hope you all get out this weekend and enjoy nature. Gosh I got all involved with the fence project and what with work taking my spare time I just didn't get around the garden for a couple of days. It is amazing what can happen this time of year when you turn your back on your garden for a few days. The apple tree popped open with blooms. It is pretty full this year. Here is an up close look at the apple blossoms. I think they are so sweet and delicate. Later blooming daffodils. These beauties are such a pretty color of buttery yellow. There are a couple of them that are turning white. I wonder if the netire clump will eventually do so or if this is just a result of the drought year last year and then all the rain this year. Now Frances I know you will appreciate this next bloom. It is on a small azalea bush. This little azalea has been in the garden several years. It started out as one of those small azaleas that I bought to decorate the Easter table a few years ago. I put it in the ground wondering if it would survive our winters or if it was just one of those greenhouse plants. The little jewel has survived despite being moved several times, with limbs being broken off and having a terrible place to grow under a maple tree. So I really appreciate its little pink blooms and it will to live. Our French Lilacs are blooming up a storm. They smell great but aren't as stongly scented as the old fashioned kind that grow across the street from our house. this bloom is on the Five leafed akebia vine known commonly as the chocolate vine. I really like this bloom I just wish it lasted longer. We had to take a short break from all the work in the garden to take our little girl to the park for a walk. It is amazing how the forest floor comes alive at this time of year. It seems like it took a few short days to get here. This path was literally lined with Rue Anomenoes. Just beautiful. Here we found a sea of May Apples. Jack in the pulpit were up and preaching. Larkspur were popping up all over the place, as were the blue phlox. Just beautiful. I must say it has been a busy past few days. As you remember this past winter we lost two big pine trees and the one crashed through our chain link fence. I dreamed up a plan and we have been busy trying to implement part one of the plan. Part one clearly was to install new fencing. Dearly Beloved and I have been working to install said new fencing. We decided to reconfigure this side of the garden. We staked out where we wanted the new fencing to be installed. Talked to our neighbor since we wanted to start our fence right by hers. She was all for it so it would look neat on this side. She sees this view more than we do. My Dearly Beloved dug all the holes for the fence. Whew, that was quite a job. Of course we kept the old fence up as long as we cold so that the Overseer would stay confined in the back garden. After the posts were in we had to slip on the jackets. Jackets is a term, used by the fencing people, for the plastic covering that goes over the posts. All has to be leveled etc. Installing this fencing isn't difficult but there are a lot of steps to follow. Since this is the first time we had ever done anything like this you can imagine how sometimes there was a step taken and then two steps back to correct what had been done. Here it is in its entirity. We are quite pleased with how it turned out. If you decide to do something like this you can be sure that it is much easier when two people work on it together. Luna is voicing her dispeasure at me being on the opposite side of the fence. She has been busy sniffing and walking the length of the new fence. New smells and new territory to mark. As you can see here. This side of the garden slopes down very steeply. We had to lower the long side of the fence. The front we kept at one height so it would look uniform from the front. On the long side we graduated the fence down three times to make sure Luna couldn't squeeze under. Right here in this corner you can see that she could squeeze under here. She has been a good girl so far though and stayed in. I put a little bit of fencing in this corner tso she couldn't go under. I don't want to test her too long. I know that if a cat or some other critter came by she might go under to get to it. I have already moved some hostas, huchera and ferns that were in the new pathway. I can't wait for more planting in this area. Whoooo Hooooo The big job is finished. I plan to just sit on the patio this afternoon looking at the new fence. I have lots of new territory too. I am busy imagining what to plant. I know a few things I want to plant here. I will have to recover some from all this. I hate to rush into anything. It couldn't be that I am a procrastinator now could it. No.... Just dreaming. We went to our usual birding area again today. I am happy to report that the water is down quite a bit and we didn't see any deer or other critters stranded as we saw last week. However I think I have mentioned before about the one Canada Goose that we have named Brutus. He is a very territorial goose and is quite ferocious and doesn't want anyone near his Mrs or their nest. Well, the silly goose has set up housekeeping right in the middle of an area that we bird. So we must drive by his nest when we check this area. Brutus is not happy. As you can see below he is coming toward us to make sure we understand his displeasure at our appearance. Today he actually flew up onto the hood of our truck and yelled at us through the windshield. This is not a happy goose. He is screaming his lungs out and stomping his feet on our truck. This is why Mon@rch warned me not to get too close to the nest. Canada Geese can be very territorial and vicious when protecting said territory. This is why I get nervous when people tell me they take food out to wild geese especially when they have small children in tow. You can imagine how courageous this fellow is since our pick-up truck didn't daunt him. I would imagine a person might come away with abruise or I have heard even a broken bone. He thumps the truck and squacks the entire time we are anywhere near his area. Needless to say we try to pass by as quick as we can but it is difficult to do when he is stomping around, charging the truck and this time jumping onto the truck to protest our appearance. if they don't understand a good tongue lashing, what is a goose to do?? My DB took the last two pictures. I took the other pictures today while we tried to avoid the Brutus. The pictures taken of him on top of the truck were taken through the windshield with the windows rolled up. Ha.. The House Wren male that I mentioned a couple of days ago is wasting no time in trying to lure a female to the nesting box right outside my window. He has offered his heart's desire a lovely stick for the box. He has done a little begging. He is acting his best "Mommy please feed me" routine. He has been singing her favorite melody for what seems to me hours on end. She has answered back a time or two but mostly has been playing at being coy. She did go in and out of the box several times. She stayed in there for a little while. I wonder what she was thinking while she was in there. Neither has taken any sticks into the box yet so the deal hasn't been made. I bet she is thinking "should I or shouldn't I"?? This is the question. She appear to be asking " What do you think"? I can't wait to see how long it takes the House wren to lure a mate to this box. He is working so dilligently but it is difficult for him to keep the chipping sparrows away from this tree. They seem to want to use this tree for spring caroling. All of these pictures my Dearly Beloved took. The first ones with the screen on the window. Then when there was a break in the action he removed the screen so the pictures wouldn't have that cloudy look.